Bullet shrimp never caught on. Photo courtesy of Lane Hardy. Swallowing sheet iron would indeed puncture the body. Sheet iron prawn is the preferred food choice for the Terminator. – Waiter! There are flies on my hors! The use-by date on the hors d’oeuvre is in Roman numerals. I could use more iron in my diet, but not if it tastes like sheet. How are the the prawns cooked? They’re weld-done. As if regular prawns weren’t unpractical enough to eat, now I need a can opener too. I didn’t know Hors was the name of the former king. Facehuggers: They’re not just for breakfast any more. Must be a pistol shrimp. Or maybe a mantis shrimp. You dictionary say “pot stickers”? No way. Dictionary man make bad joke, try again. It’s amazing that they taught a prawn to iron sheets. It probably started with handkerchiefs. 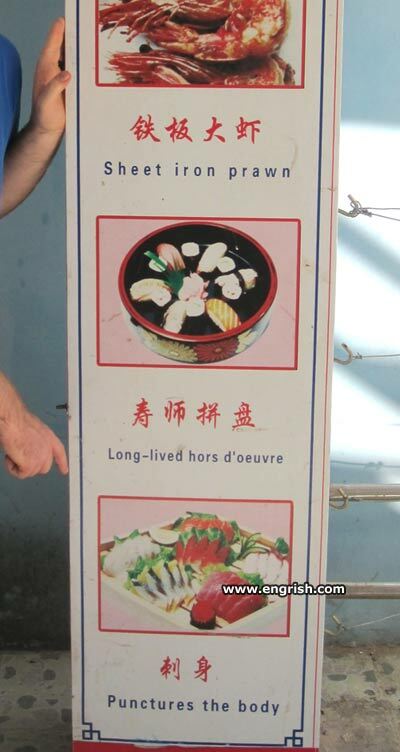 The Hors d’oeuvre date from the time of the warring states. In fact they were left over from Sun Tzu’s christening party. Buy one of the sliced whateveritis, and you get a free acupuncture. @jjhitt. So spake Zarathrustra with a voice like thunder. Doesn’t look like fugu to me. The point is that this must be the sharpest-looking menu ever. Mmmm … Nine Inch Nails! Sheet Iron Prawn is my Kung-Fu name! What are the odds! Ooops! The swordfish is on the loose again. The sheet iron prawn has a nice crusty coating – sorry, I mean rusty. According to my careful prosthesis, this man died from wounds inflicted by a blue point oyster! This is our Heavy Metal Menu. We also have disco, Top 40, and easy listening menus for our rock and roll challenged customers.